When spring arrives the asparagus is at top in terms of quality, so it's definitely a good time to produce some nice dishes with it. If you don't want to loose the delicate flavor of the asparagus among other ingredients, then this dish is ideal to make since it really highlights the fresh green flavor of asparagus. To serve a poached egg in this smooth soup is a great way to make it a bit more satisfying, and if you have some nice rustic bread alongside, then you have a whole meal. Sautee the onion in the butter in a pot. Cut the asparagus up and save a few nice tops for garnish later. Once the onion has cooked for about 10 minutes, add the asparagus and then the broth. Cook until soft, about 10 minutes. At this point blend finely, and add the cream. Taste with salt and pepper. In a separate pan, add some butter and sautee a few asparagus tips for a few minutes on pretty high eat. Poach 4 eggs in water. We prefer them a bit loose, but that's up to you. 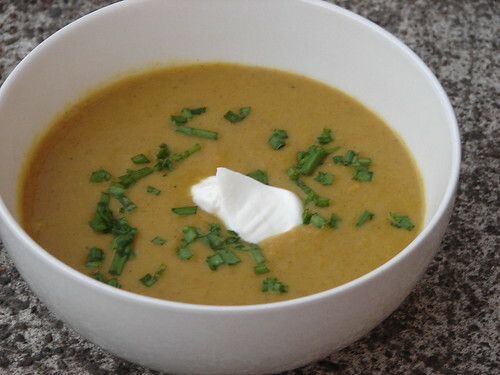 Serve the soup in bowls, with a poached egg dropped in each and some sauteed asparagus tops on top.